4 + 8 = Required Please enter the correct value. 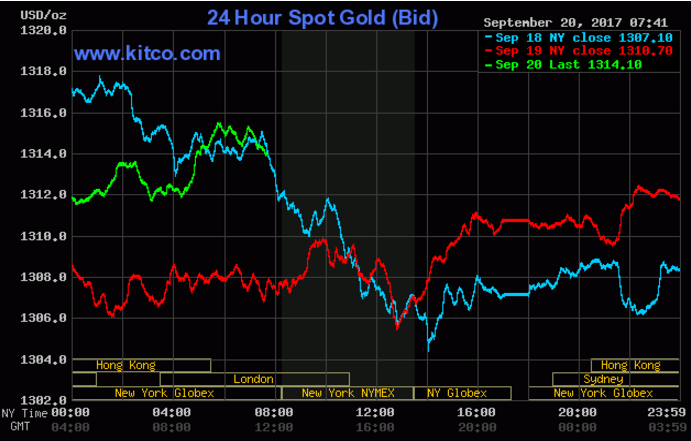 (Kitco News) – World stock markets were mixed in subdued trading overnight. U.S. stock indexes are pointed toward narrowly mixed openings when the New York day session begins. Gold prices are higher in pre-U.S.-session trading, on bargain hunting, short covering and some safe-haven demand following a fiery speech by U.S. President Trump at the U.N. on Tuesday. Trump threatened to completely destroy North Korea. Markets have paused ahead of the Federal Reserve's Open Market Committee (FOMC) meeting that began Tuesday morning and ends Wednesday afternoon with a statement. No interest rate changes are expected from the FOMC at this meeting. However, it is expected the Fed will announce it is drawing down its big balance sheet of securities. Fed Chair Janet Yellen will hold a press conference after the FOMC meeting ends. Also, the Federal Reserve will release new economic projections. The inflation projections will be examined very closely. The key outside markets on Wednesday morning see the U.S. dollar index weaker. The greenback bears remain in firm technical control. Meantime, Nymex crude oil futures are higher this morning. The oil bulls have the slight near-term technical advantage. Other U.S. economic data due for release Wednesday includes the weekly MBA mortgage applications survey, existing home sales and the weekly DOE liquid energy stocks report.